Dr. Nathan Walters receives Patient’s Choice Award for second year! Congratulations to CSC’s Director of Pain Management, Nathan Walters, M.D. for receiving the Patient’s Choice Award again in 2010! Patients’ Choice recognition reflects the difference a particular physician has made in the lives of their patients. The honor is bestowed to physicians who have received near perfect scores as voted by patients. Every month, more than 60,000 patients across the U.S. provide online feedback about their experiences with their doctors. They rate various components such as bedside manner, doctor-patient face time, degree of follow-up, courtesy of office staff, and overall opinions. Over the course of 2009, these reviews have totaled hundreds of thousands patient opinions. While physicians generally receive positive reviews from their patients, only a select few receive uniformly rave reviews across the board. Of those who have received rave reviews with near perfect scores by their patients are awarded this honor. In fact, of the nation’s 720,000 active physicians, less than 6% were accorded this honor by their patients in 2010. View Dr. Walters’ winning Patient’s Choice profile, and read more information about Patient’s Choice. 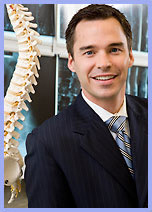 Nathan Walters, M.D., is director of pain management and specializes in conservative treatments.